What would you do if you became stranded in your vehicle? 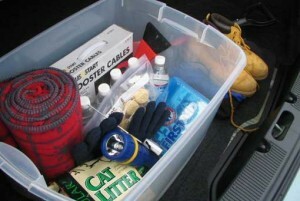 Creating an emergency kit to keep in your car can be a lifesaver, literally. What items should you include in an emergency kit? 1. Kitty Litter- this can help get your car unstuck in an emergency situation. 4. Heated Emergency Blanket- you can find these in the camping section of most stores. 13. Extra Hats, Gloves, Scarves, etc. Although we hope you will never be in the situation to use an emergency kit, it is always a good idea to be prepared! Drive safely!